The coat o airms o Norawa is a crouned, golden lion rampant hauldin an axe wi an argent blade, on a crouned, triangular an reid escutcheon. Its elements oreeginate frae personal insignias for the ryal hoose in the Heich Middle Ages, thus bein amang the auldest in Europe. In Norrowey, the moti o the coat o airms is aften cawed «Den norske løve», literally translatit «The Norse Lion». 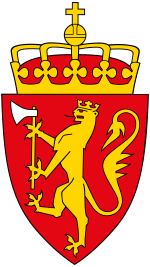 Wikimedia Commons haes media relatit tae Coats of arms of Norway.